After making fish with paper and glue, the children work together to create an ocean with paste paint. For ages 3 to 6. Plan 3 sessions. Blend the flours together. Stir in a little water to dilute the flour and continue to stir while adding the remaining water. Cook over medium heat, stirring constantly, until the mixture resembles thin custard and just starts to boil. Remove the paste from the heat and stir in the glycerin and dish detergent to keep the paste smooth and pliable. After the paste cools, put it through a sieve to get rid of any lumps. Gradually add tempera paint to the paste to achieve the desired color. Be sure to test the paste. If it is too thick, add cold water. If the paste runs back over drawn lines, it is too thin and needs to be cooked longer or left open to air-dry until it thickens. The paste will last about three days in a refrigerator. Set out construction paper, scissors, glue sticks, and dampened sponges. Have pictures of fish available to share. Explain to the children that they will be working together to make a mural which is a large display usually attached to a wall. In this session they will be using paper and glue to create fish. In the next session they will be working together to make an ocean for the fish. While sharing the pictures of the fish, discuss their shapes and unique parts, pointing out the variety of tails and fins, scales, round eyes, and array of colors. Have the children complete their fish. Prepare the paste paint, test its consistency, and set it out in bowls or wide-mouth jars with brushes. Secure the long sheet of paper to a work surface with tape. 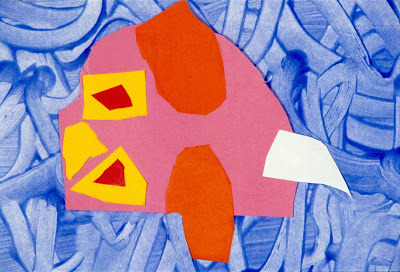 Explain to the children that they will be working together to make the ocean for their fish using paste paint, a colored paste prepared by adding paint to a boiled mixture of flour and water. By pulling their fingers through the wet paste, they will create negative or empty areas where the paste has been displaced. In the air, demonstrate with your finger the ripple patterns in water that are created by waves. Have the children do the same with their fingers to “feel” the movements. Explain that after brushing the paste paint on the sheet of paper, each child will take a turn to move his/her finger from one end of the paper to the other, creating the waves in the ocean. Load the brushes with paste paint and glide it across the paper in horizontal strokes. Since the paste tends to dry quickly, be sure all areas are covered with a fairly thick coating. After spreading the paste paint evenly across the paper, have the children take turns pulling their fingers through the wet paste in a wave pattern across the paper. Have paper towels available to wipe messy fingers. Note: As the paste-painted paper dries, it will likely ripple and curl. Flatten it by ironing the dried paper on the reverse side. Set out the paper fish. Attach the paste-painted paper to the wall using adhesive putty. If making the optional booklet, set out drawing paper, black permanent markers, and watercolor markers. Tell the children that they will be working together to decide the placement of the fish in the ocean. Afterwards, they will be drawing pictures of their fish for a booklet to be used for identifying the individual artists. While each child holds his/her fish on a spot in the ocean, have the children discuss whether the chosen placement creates a pleasing or balanced effect. For example, two fish of the same color will stand out better if separated from each other and large fish will appear more unique next to smaller fish. When a location is decided, give the child a small piece of adhesive putty to attach the fish. Repeat this process until all the fish are placed in the ocean. 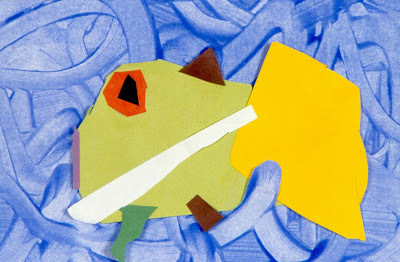 To make the booklet when the mural is completed, give the children drawing paper and black markers to draw their fish. Have the children color their drawings with watercolor markers, duplicating their fish as much as possible. Be sure that the children write their names on the bottom of their drawings. Explain that these drawings will be displayed in a booklet near the mural so that observers can identify the artist of each fish. Note: Make the booklet by punching a hole in the corner of each drawing and holding them together with ribbon, string, or a metal ring. Be sure the booklet is easy to open because it will be very popular with observers. 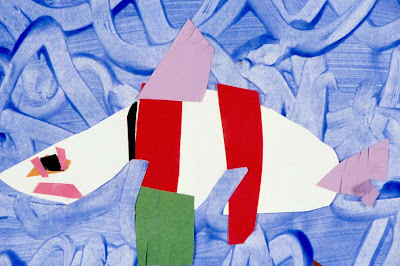 To keep the fish a manageable size, cut the construction paper to be set out in the work areas into 6- by 9-inch pieces. When paste painting the water with a large group of children, plan on having an extra adult in the classroom. Wrinkles and folds in newspapers leave marks in the dried paste paper, so it's best to work with the paste paint on an uncovered flat surface. The paste paint usually washes off easily using a household cleanser, but you should test it to be sure. Have the taller children do the waves at the top of the paper, since the shorter children will not be able to reach so far. Small pieces of the adhesive putty actually work better than larger pieces to attach and hold the fish in the ocean. 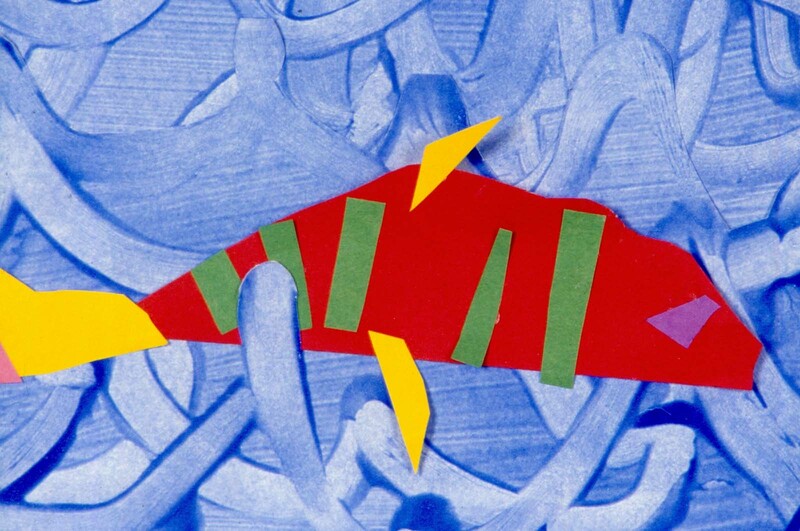 To better integrate the fish with the ocean, have an adult use an exacto knife to cut along the lines of several waves and insert fish behind them. If you have the children draw the pictures of their fish before putting them in the ocean, be sure that they understand to not use the markers on the paper fish. The children are fascinated with the paste paint process, so they enjoy watching as they wait for their turn to make a wave. The paste-painted paper needs to dry before the real effect can be seen. The ridges that are formed when the paste is displaced will be deeper in color and appear almost three-dimensional. Even the youngest children will have success with this project since any shapes that are put into the ocean will become "fish." Discuss the variety of fish that the children made. Are the fish carefully glued together? Review the process of placing the fish in the mural in a balanced manner. I’m having trouble cutting the paper. Everything is sticking to my fingers. I can’t find a marker to match the color of the tail on my fish. Can I make an eel? I made my fish swimming in the wrong direction! Remember to put your thumb in the small hole and your fingers in the larger hole of the scissors. If your fingers are sticky, you should wipe them on the dampened sponge. Choosing the color of marker that is the closest to the color of the tail on your fish will work well. An eel is a great idea to add to our ocean of fish. Our mural will look more interesting having the fish swimming in different directions, just as in the ocean.